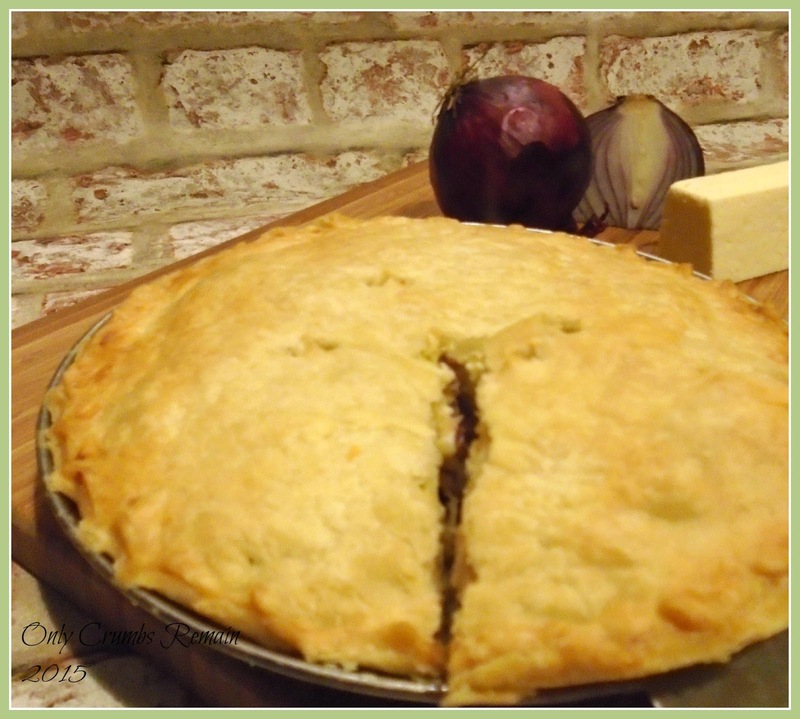 Made with a regional cheese, this homely cheese and onion pie, is full of flavour and comfort. As a child were you given the choice of deciding what was on your birthday tea menu? It always seemed so exciting to be able to choose your current favourite meal for your birthday. My brother and I never chose anything outlandish or extravagant, it was often something simple and comforting like pizza or burgers. Mr E & I still do that now, it must be the big kid in us or something! 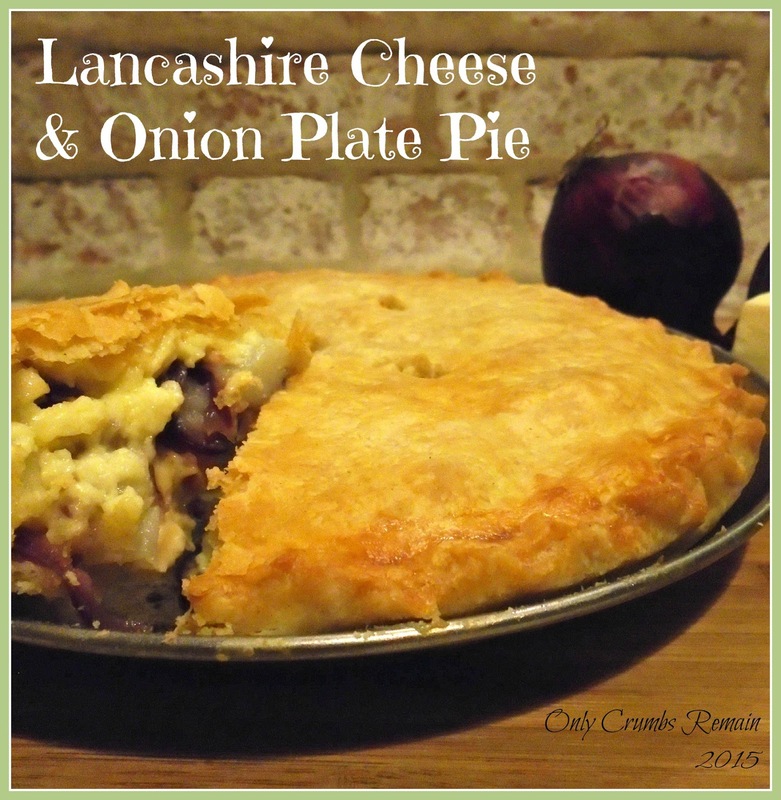 The other week saw us celebrate Mr E’s birthday, and if you’ve not already guessed what he chose for tea given the post title and images, it was cheese and onion pie, specifically Lancashire cheese and onion plate pie. Well he’s a Lancashire lad, so it had to be a Lancashire cheese sat alongside those wonderful onions. However, we decided to make it as a plate pie, rather than a deep filled pie. There was still plenty of filling in the pie, however it meant that the portions were more manageable given the high fat content of the pastry and cheese. One of Mr E’s favourite food smells is fried onions, correction, it is his favourite food smell. If I’m cooking them he will often stand next to the oven with his nose over the pan, smelling it all in. Unfortunately, onions don’t like him! Although we clearly do cook with onions we tend not to go over board with them, but on occasions, like his birthday, it’s just nice to have what you fancy. The cooked onions are just divine when teamed with a lovely tangy and crumbly cheese. And when that cheese and onion classic combo is housed in a short crust pastry, well, what’s not to like! Given onions dislike of Mr E, I decided to add a few potatoes to the affair; well I don’t want the birthday boy to suffer. I also used red onions, which I tend to find a little less strong. Regarding the pastry, I decided not to use all butter. As a teen, all those years ago, I would always make savoury pie pastry with a 50/50 mixture of butter and lard. Given that our household is vegetarian, lard doesn’t find its way into our shopping basket but as we still had some Trex in the fridge from successfully making a hot water crust vegetarian ‘Pork’ Pie I decided to try it in our short crust pie pastry. Waste not want not and all that. It worked a treat, the pastry was far shorter than usual and it’ll be a fat I’ll use in my short crust pastries again. Of course, if you prefer, do use shop bought pastry as it’s pretty good these days. Time: about 30 minutes hands on time; 30 – 35 minutes bake time; plus 5 minutes cooling time. 1. Cook the potatoes. Peel the potatoes and cut into cubes of equal size to allow for even cooking. Rinse. Put the potatoes into a pan and cover with water. Place the pan on the hob over a medium heat and cook the potatoes gently until there is no resistance when a sharp knife is inserted. Strain the potatoes and set aside to cool. 2. Prepare the onions. Cut the onions in half and peel away the outer skin. With a sharp knife slice the onion finely. Place the butter and a little cooking oil into the frying pan and set over a medium heat. Once the butter has melted and warmed through add the sliced onions to the frying pan. Reduce the heat under the frying pan and cook the onions slowly. You don’t want them to colour or become crisp, you’re aiming for them to become translucent and soft. This may take around 15 minutes. Move the onions around periodically as they cook. Once cooked tip onto a sheet of kitchen roll to absorb the excess oil. 3. Meanwhile, make the pastry. Place the flour, salt, chilled butter and Trex into a good sized bowl. Use a knife to cut the fat into small pieces coating it in flour as you do so. Rub the fat into the flour between your thumb and finger tips, until the mixture resembles breadcrumbs. Make a well in the centre of the breadcrumbs and add the water, a little at a time. Using a rounded pallet knife, or similar, cut through the mixture to make a dough. You may not need all of the water. Bring the dough together and shape into a ball and flatten into a disc. Wrap in cling film and place into the fridge for 30 minutes to chill. 5. Line the pie plate. Remove the pastry from the fridge and cut in half. Place one half onto a lightly floured work surface. Roll the pastry out until it is nice and thin, about 2mm. Wrap the pastry around the rolling pin, lift it up (using the pin) and place onto the pie plate. Gently tease the pastry so that it sits into the edges well. If the pastry tears, patch it with surplus pastry. Roll out the remaining pastry for the pie lid. 6. Fill the pie. Break up the potatoes with your hands into smaller chunks. Combine with the onions. Season the mixture. Place half of the grated cheese into the pastry case. Add the potato and onion mixture. Top with the remaining cheese. 7. Finish the pie. Using a pastry brush, paint the edge of the pastry with a little milk. Use a rolling pin to lift the rolled out pastry and lay over the filled pie plate. Use your hands to gently apply pressure to secure the pastry lid to the base. Trim away the excess pastry. 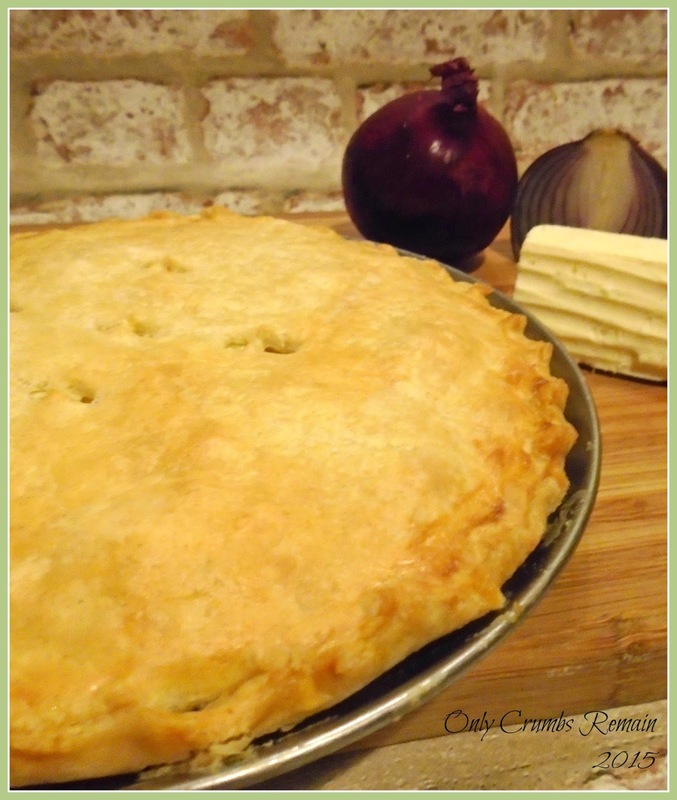 Use your thumb and two forefingers to crimp the edge of the pie. Paint the top of the pastry with milk. Cut an air whole in the centre of the pie. 8. Bake. Place the pie in the oven and bake for 30 – 35 minutes until the pastry is cooked through and a beautiful golden colour. You may need to rotate the pie half way through the bake. Remove from the oven once cooked and allow to cool for 5 minutes before cutting into it and serving. Thank you Vicki, it was just what the doctor ordered in this colder weather! Ah, thank you Sarah, I've learnt something new there. I'd not thought of using it in my mince pies, I had really only considered using it for savoury bakes – though there again our Christmas minced pies are were made from meat once upon a time. Oh Laura, how can you not be a fan of cheese 😉 Think we've got 4 different types in fridge at moment. I must say I don't care for the veined ones etc. I love how powerful food and food smells are at bringing back fond memories. That's Rebecca, it was a great choice by Mr E now that the weather is getting a little colder! It's delicious isn't it. I'm intrigued to know, does your Grandma use Lancashire Cheese also given that she lives in Manchester?